When other epoxy kits claim to be a “full kit,” they are not actually being 100% honest. Other kits are “a full kit” in terms of the chemicals required to complete the project, but there is still a lot of other stuff required to get the job done. 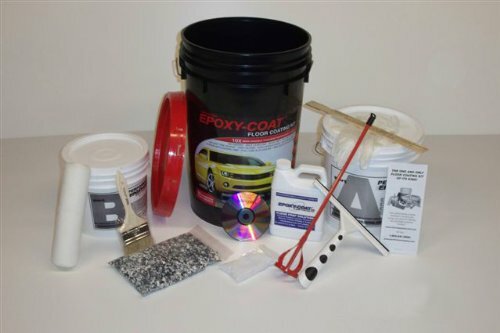 This kit from Epoxy-Coat, however, is a true full kit. You can order this (and only this) from Amazon and have everything you need to transform your garage floor into a thing of super durable beauty. But is all the extra stuff included in the kit making up for a poor epoxy? Do you actually need everything that is included? Let’s find out in our Epoxy-Coat Full Kit Smoke Blue review. The color of the epoxy in this kit is quite honestly brilliant. It’s not the best we have ever seen, but it’s pretty darn good. It’s called “smoke blue”, but in reality, it’s a medium gray (with possibly a very light dash of blue thrown in if you squint your eyes a little). It’s a high gloss epoxy that will retain a wet look for many years without losing its shine. 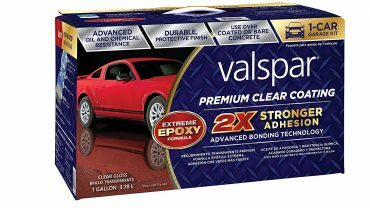 Like all good epoxies, this kit provides you with more flakes than you actually need for an “average” coverage. If you want to go nuts and make your floor a focal point, use them all. If not, take it easy with them. This is a fairly durable product. The manufacturers claim it’s ten times stronger than normal epoxy. We are not sure if this is true, but it’s certainly thicker (which usually means stronger in the world of epoxy coatings). It’s not going to chip or scratch, and it’s going to resist all manner of common garage spills with ease. It’s going to be harder than concrete (and it’s going to last you decades before it needs replacing). So this is the good part, the kit. We haven’t done the math, but you need all of those things we just listed to apply any epoxy kit properly. If you were to buy them separately, you would be spending quite a bit of money. It’s the “hidden cost” of other epoxy kits. The application is easy, and full instructions are provided with illustrations. It dries reasonably fast (24 hours for walking, 72 hours for driving) and you can do around 500 SqFt with the kit. This is enough epoxy to properly cover a standard two car garage with a little extra to spare. If you have most of the things included in this kit already, then this may not actually be the best product for you. There is no point duplicating things that you already own for the sake of it. However, if you don’t have much of the stuff we listed above in your garage already – we highly recommend you consider this kit. You need everything in it. The convenience combined with the very affordable price tag is a very attractive prospect to us. When you combine that with the fact that the actual epoxy is pretty darn good, it’s a winner in our eyes. We highly recommend that you add this product to your shortlist as it is more than worthy of your consideration.